Canada’s Tessa Virtue and Scott Moir rode the wave of momentum from their gold medal-performance in the team event to a stellar short dance in the individual competition Monday. Skating to a Latin-inspired 70s rock medley, the Canadians earned level four on all of their elements en route to the 83.76-point world record. They lead their closest challengers, two-time World champions Gabriella Papadakis and Guillaume Cizeron of France, by 1.74 points. Papadakis and Cizeron, who are four-time European champions, earned 81.93 points, with level fours on all of their elements but one. The score is all the more impressive given that they dealt with a costume malfunction at the start of the program, when the back of Papadakis’ dress came undone at the top. The team said they were confident they could make up the point deficit in the free dance. 2018 U.S. Champions Madison Hubbell and Zachary Donohue earned a new personal best of 77.75 and sit in third place. They received a level four on the rhumba pattern, and have increased the speed on their already-fast twizzle sequence. The three top teams after the short dance all train with five-time Canadian Champions and two-time World silver medalists Marie-France Dubreuil and Patrice Lauzon in Montreal. 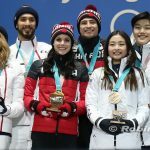 Maia and Alex Shibutani of the U.S. are in fourth place, only 0.02 points behind their countrymen, Hubbell and Donohue. The two-time U.S. champions and reigning World bronze medalists earned 77.73 points, an improvement on their score from the Olympic team event last week. A level two on the rhumba pattern cost them some points. “It’s an awesome program and I think that we surprised many people with our ability to perform the Latin rhythm. It’s been so much fun for us, because we are able to show our personality. 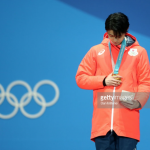 We’ve always had the technical goods, so it’s really nice to package all that into such an awesome performance, especially here at the Olympics,” Alex Shibutani said. 2014 World Champions Anna Cappellini and Luca Lanotte of Italy earned a personal best short dance score of 76.57 points — and a coveted spot in the final warmup group for the free dance. “We will be in the last group in the Olympics tomorrow. We want to fight for a medal and we want to be among the best. We stayed in it for a reason, to show that we are that couple. I think today we showed it again [with] how we performed, and we hope to do well in the free dance,” Lanotte said. The third American team, Madison Chock and Evan Bates, overcame a difficult warmup to earn a season’s best score of 75.45 points. Chock’s boot hit the ice when they practiced their curve lift in warmup — she in a difficult split position balancing on his boots — and she fell. After the performance, she posted on her Instagram account that her ankle was fine, and that she and Bates “had a blast on Olympic ice.” They are only two points out of medal position heading into tonight’s free dance. Follow us @FSOnline on Twitter and our friends from Ice-dance.com @icedancecom for live tweeting of the free dance Tuesday (in Korea), Monday( in the U.S.).